You are assigned a role to develop a new system based on the project case study. Draw a context diagram and a level-0 DFD for it. The report is describing the Professional and Scientific Staff Management (PSSM) System. Professional and Scientific Staff Management (PSSM) provide temporary staffs to companies for some specific jobs. 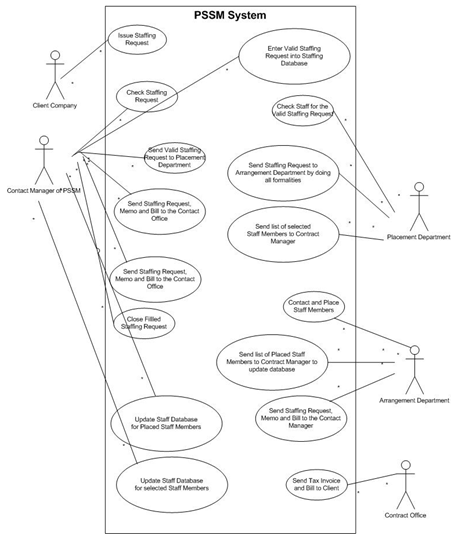 The report is describing the complete management system of Professional and Scientific Staff Management by using UML diagrams. Context diagram, use case diagram, class diagram, activity diagram and sequence diagram are showing the complete process of Professional and Scientific Staff Management (PSSM) System. The basic flow of the PSSM system is being described by Context diagram while use case diagram is showing the complete behaviour of the Professional and Scientific Staff Management (PSSM) system. The domain class model is showing the objects, classes and attributes which are being used in the Professional and Scientific Staff Management (PSSM) system. 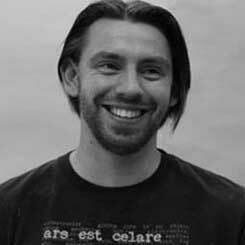 Without domain class model; the system will not be developed. Thus every model is necessary to describe and implement a good system. Activity diagram shows the workflow of every process of the entire system graphically while the system sequence diagram shows every aspect like actors, events, their order and complete flow of events of the entire system. Draw a use case diagram by using the Level-0 DFD that you provided in Task 1. Develop a domain model class diagram for the system based on the project case study. The domain class model is the conceptual model. The above domain class model is showing the objects, classes and attributes which are being used in the Professional and Scientific Staff Management (PSSM) system. It is describing all constrains in the system for all cases. It is not showing the solution of the problems which will occur in the PSSM system. (Scott W. Ambler, 2014). Using the Activity Diagram above, produce a system sequence diagram, i.e. only include two swimlanes – one for the actor (PSSM employee) and the other for the entire system as a system class object. One object is ‘Client Company’, one is ‘Contact Manager’ and another one is ‘PSSM System’, is being displayed in the above system sequence diagram. Every flow between these objects is clearly visible in the diagram which is very useful to understand the flow of the system. The report of Professional and Scientific Staff Management (PSSM) System is defining the complete understand of the system. It is showing context diagram, use case diagram, class diagram, activity diagram and sequence diagram. Every class, object and attributes which are necessary to implement the system are defined by class diagram and every case which can be occur to implement the best system is defined in the report. The new system has some changes than previous system. In new system, the right to update the database will be given to only one person to escape data mismatch in the system. Thus every person has no right to update database like previous system which was the major reason of degradation of the system but the new proposed system is eliminating this drawback and improving the performance.